THE TWENTY-FIFTH of December was considered by Catholics and Protestants as Christmas day – the “birthday of Christ.” It is the most celebrated holiday of the year throughout the world. Yet amidst all merry making activities of the “yuletide season”, members of the Iglesia Ni Cristo (Church Of Christ) are visibly non-participants in the worldwide commemoration of the alleged birthday of Jesus on December 25. However, the non-participation of the Iglesia Ni Cristo in the “December 25 festivities” does not mean that we are against fun and merriment; neither are we anti-social nor against fostering peace and goodwill among men. Neither are we opposed to the idea that the birth of Christ is a day of rejoicing. On the day Christ was born, angels from heaven rejoiced (cf. Luke 2:13-14). We must also make it clear that the Iglesia Ni Cristo are one in the belief that the baby born in Bethlehem who was the son of Mary is Christ, our Savior. 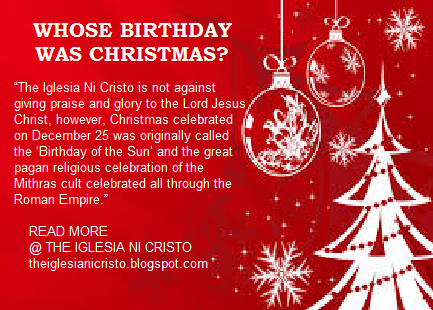 So, why the Iglesia Ni Cristo refrain from participating in celebrating Christmas? Indeed, there was no verse in the Bible that says that Jesus was born on December 25, that “Christmas” was celebrated by the early Christians, and that the birth of Christ is to be commemorated. Thus, Christ has nothing to do with the December 25 celebration though He is supposed to be the center of the festivities. There has never been a single statement from Jesus nor from the disciples commanding the commemoration of His birth. Instead, we find extra-biblical sources for the celebration traceable to pagan festivities of which the Catholic Church is fond of adopting as its own. More so, these appeared only centuries after the establishment of the Church of the New Testament. Christmas was not celebrated, nor known in the Apostolic and early post-Apostolic times. The Catholic book quoted above attested that there is no mention of Christmas in any of the oldest lists of the festivals of the Catholic Church, and that the celebration Roman Catholic Church (the Church which follows the Latin rite) of Christmas in December 25 was begun probably about the middle of the fourth century. The first mention of Christmas celebrated on December 25 was in 336 AD only. Thus, history attested that the “first Christmas” would have been held only on the fourth century AD, or more than three centuries after the birth of Christ in Bethlehem. Certainly, however, Christ had nothing to do with the dated for He had ascended into heaven in the first century. Obviously, His apostles could not be the source of the selection of the date of the Nativity in the fourth century since they all died even before the second century. Surely, the celebration of Christmas emerged not because it was commanded by the Lord Jesus or His Apostles, but by other reasons. What was the origin of the celebration of Christmas? Who was responsible for the initiation of the christmas celebration? This Catholic book admitted that Christmas originated in the fourth century when Constantine joined it with a pagan feast. Any diligent student of Church history can easily discern why this is so. The influence of paganism to the Catholic Church began overtly when Constantine the Great ascended to the throne as the first “Christian emperor” of the Roman Empire. However, at first, the celebration of Christmas was done on January 6, coinciding with the pagan festivals celebrating the birth of the new year. At first, the celebration of Christmas was held on January 6. However, who was responsible for the initiation of the December 15 celebration? What were the reasons for choosing that particular date from among the 365 days of the year? Catholic authorities admitted that that the actual date of the birth of Jesus was unknown. If any biblical verse would be cited to support their claim, we would have found it in their writings on Christmas. But again, nowhere could we find substantial presentation of biblical evidences but rather their admission of the absence of any evidence at all. Christmas originated in the fourth century when Constantine joined it with a pagan feast. But, at first, the celebration of Christmas was done on January 6, coinciding with the pagan festivals celebrating the birth of the new year. January 6? How the date of the celebration of Christmas became December 25? Thus, it is a fact that only a Roman Pope by the name of Julius I was responsible for assigning December 25 as the date of the celebration of Christmas. First celebrated on January 6 (coinciding with the pagan celebration of the birth of New Year), the Church at Rome changed it to December 25. Obviously, Julius I not only erred in assigning the date of Christ’s birth per se but was even indecisive in moving the date from January 6 to December 25. Whose birthday was “December 25”? What made Julius I, the “head” of the Roman Catholic Church, subscribe to pagan festivals and practices? Why the choice of December 25 that coincide with the celebration of the Mithras cult of the “birthday of the Sun” – their god, Sol Invictus? Hence, the December 25 tradition with its practices is a “Christianized” pagan festival. The riot and merry making is dedicated no longer to Sol Invictus but now to Christ Jesus! What were once dedicated to a pagan god are now dedicated to Christ as birthday presents. What insult can be greater than this? Catholic authorities admit their interest in adopting customs and traditions from pagan rites and ceremonies in their worship allegedly for the sanctification of their members. Thus, an indirect admission of that Mithras cult overcoming the Roman Catholic Church. It is interesting to note that even the etymology of the term pagan would show the incompatibility of Christianity and paganism. Any good book in church history would contain the origin of the term. “In particular, I want to urge you in the name of the Lord, not to go on living the aimless kind of life that pagans live. Intelectuallythey are in the dark, and they are estranged from the life of God, without knowledge because they have shut their hearts to it. 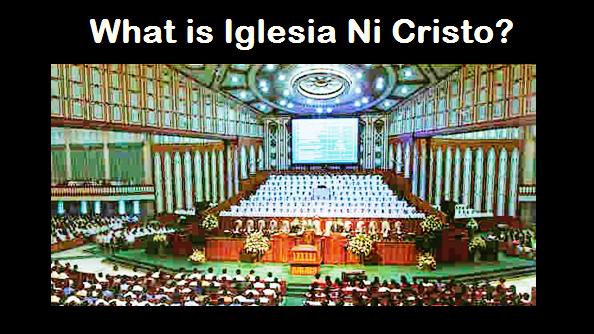 Thus, although the primary purpose of the Iglesia Ni Cristo is to praise and glorify the Lord Jesus Christ, but we never ignore the pronouncements of the Bible. We praise and glorify Him in accordance with the teachings of the Bible, the reason why we don’t participate in Christmas celebration. The Christmas celebration is pagan and anything pagan is abhorrent to Christ. To make this an activity honoring Him on His birthday is not only erroneous and unscriptural but a great insult to Him as well. How can one, in his mind, offer a person something which the latter abhors?